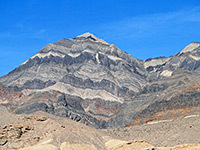 The mountain ranges along the west side of Death Valley rise to over 11,000 feet and allow road access at only one point about half way along, where a wide sweep of open land slopes towards the sand dunes in the center of the valley. 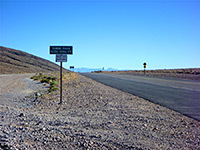 This is the end of Emigrant Canyon, through the lower part of which state road 190 provides access to the national park from the west, starting from US 395 at Olancha in Owens Valley, beneath the southern Sierra Nevada mountains. A secondary road leaves CA 190 close to the main valley and heads along the upper canyon, across a plateau beyond and on into the mountains, past perfect desert scenery, with vistas of distant hills and valleys, which make this scenic drive one of the best in the park. From the cross-roads in the center of Death Valley National Park, CA 190 passes the edge of the Mesquite Flat sand dunes, the Devils Cornfield and the village of Stovepipe Wells, near which two short side-tracks lead to Mosaic Canyon and Grotto Canyon, a pair of unusual narrow ravines. The highway, still below sea level at this point, then climbs gradually by 2,300 feet over the next 9 miles to the Emigrant Canyon junction. The majority of traffic passes on by, perhaps eager to cross the rather barren land between here and the relatively well-travelled US 394 corridor as quickly as possible, hence the side road is usually quite empty, and the drive is peaceful and evocative. 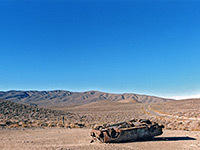 The first 8 miles are along the canyon - gently winding, past steep grassy slopes and low rocky cliffs, across the Harrisburg Flats and climbing to a high point of 5,318 feet at Emigrant Pass; around here the landscape is much more open with views over wide plains to far-off mountains both east and west. Two side roads head towards the sites of the old mining towns of Skidoo and Harrisburg (this latter continuing to a fine Death Valley overlook at Aguereberry Point), where various photogenic relics may be seen, and another track into Wood Canyon offers some nice places for free camping. The road begins to descend down a narrow ravine (Wildrose Canyon), and becomes steep and unpaved. 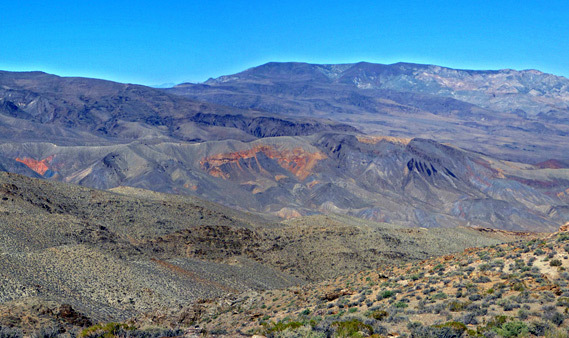 It eventually meets state road 178 but most visitors take a left turn up the canyon, past a ranger station and campground, and head into the foothills of the Panamint Mountains. This is high country - steep, wooded, cool by comparison to the desert lowlands and so a good destination for hot summer days. 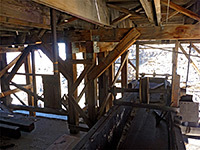 There are two long hiking trails - 4.2 miles to Wildrose Peak and a more strenuous 7 miles to Telescope Peak, the highest summit in the Panamint range. 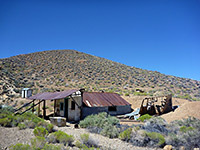 The approach road becomes unpaved towards the upper end of Wildrose Canyon, although the surface remains good to the first of two primitive campgrounds, and deteriorates only at the very end, near the second campground, beyond which the Telescope Peak trail begins. 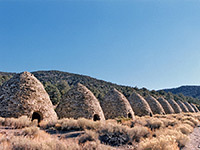 Another point of interest is the Charcoal Kilns - a neat row of 10 stone-built, conical structures built in the 19th century for the smoking of locally-felled pinyon and juniper wood to produce charcoal for silver ore smelting. They are long disused but well-preserved, and can be reached before the rough section of the road.